Where did you spend your Raya holidays? I didn't expect it, but when I was asked this question many, many times, I found myself pausing and in a daze. It's such an easy, innocent question, but it hit me hard. I only realised how difficult it was to answer this question when I was asked during an interview for a magazine. I stopped and I couldn't answer it at all. The reason why I couldn't answer it was because I suddenly realised when I was suddenly asked that question, in my mind I was thinking: When will I be visiting Jibrael's grave? But at the same time, I couldn't say it out. Of course, people mean well when they ask this question. But I was afraid to talk about it because I was afraid of people's reactions if I had actually expressed what was on my mind at that time. I was scared of the look that's sure to come after I mention my daughter's name. It's either the "uncomfortable" look or the look of pity or sympathy, or even the tears on someone else's eye. That is not how I want people to remember my beautiful daughter. It's painful to see those looks even though I know in my heart that they mean well. So through the years I've learned to contain my feelings. So, I just say: "Oh yeah, I'm raya-ing in Kuala Lumpur and will be going to Ipoh to visit my Atok on the second day of Raya" but the truth is, I always pause and need to compose myself. Flashbacks and images replay in my head when it happens. Sometimes I stutter when I answer, and sometimes when the words don't come out, I just smile. Or I'll try to avoid the question or deflect the question by pretending not to hear it and ask the person who's asking where they are going. But it was all overwhelming. One day, I was in the surau with some friends. And then, suddenly I myself had the courage to ask the innocent question which I myself feared. I asked : "Are you excited for Raya?" And then a friend of mine said: "no". Even though it's not the answer that everyone expected for Raya (it's Raya everyone is supposed to be excited!) but somehow I felt relieved. Because someone else was feeling the same thing I did. The only thing was that I was afraid to admit it. I was afraid to admit that I was not looking forward to Raya because something feels missing. That, and the fact that Ramadhan, the fasting month is ending. I then asked another friend : "You beraya kat mana? (Where are you going for Raya?)". Then after she answered, I suddenly opened up. I told her that I was planning to go to Jibrael's grave the day before Raya. Then I would visit my grandmother's grave and usually the night before Raya, we will gather at my aunt's house where my grandmother used to live. My grandmother passed away 2 years ago when I was in the hospital carrying Jibrael. I couldn't see her one last time or pay my last respects to her when she passed away so her passing also affected me very deeply. The last time I saw her I told her I was pregnant with my daughter. We still make it a point to gather at my aunt's place. Anyway, I've wanted to share how I feel for the longest time, but somehow it's easier for me to share about my work rather than my personal feelings. And to be honest, I actually wanted to blog every day for the past week. Talking about it is even more difficult than writing. I have so many contents in my drafts and folders that I want to share here. But I just couldn't, because I had this mental block. I couldn't write about anything else until I wrote about how I feel, not having Jibrael here with me. I just couldn't. I did posted a lot on Instagram though. I just had to to battle and struggle against the blocks and emotions. Like I said earlier, I've actually planned to go and visit Jibrael and my Grandmother's graves on the day before Raya, Thursday last week. I also planned to run some last-minute errands. It turned out, the day before Raya, that I couldn't bring myself to get up and go. It was just so difficult. I still can't understand it, until today. I was just so confident the day before that I would be able to go with the husband. But on the day itself, both of us just couldn't. It came to a point where I broke down when I least expected it. I didn't go. The reason I was so confident that I could bring myself to go was because on the first Raya without Jibrael in 2013, I went on the morning of Raya itself. The year after, in 2014, I actually went the day before which I felt was a good thing because I could focus more on my family and relatives on the first day of Raya. So, since I was able to do it last year, I thought this year was going to be easier. Wow, was I wrong. It's weird that I started blogging about expecting the unexpected (read : Expect the Unexpected) but I myself most often forget to expect the unexpected. What I felt on that day, how I couldn't even bring myself to go was totally unexpected. I spent the whole day at home, didn't have the strength to go out and at the end of the day I felt bad that I couldn't go. I started to blame myself. I felt that I didn't want to go out at all that whole day, but then I promised my family and relatives that I would be at my aunt's house. They had a theme and prepared a lot of food for the last berbuka puasa. It was a family tradition since I was little so I pushed myself and went. The husband and I arrived really late though. Initially, I didn't feel the joy or celebration at all. I didn't even want to take photos. But at the end of the day, after talking with my family, catching up with relatives, playing with my nieces and nephews I felt much much better. I tried my best to do what we do best together as a family. I really am blessed to have wonderful family members and relatives who's been so supportive and non-judgmental towards what I've been going through especially the past few years. 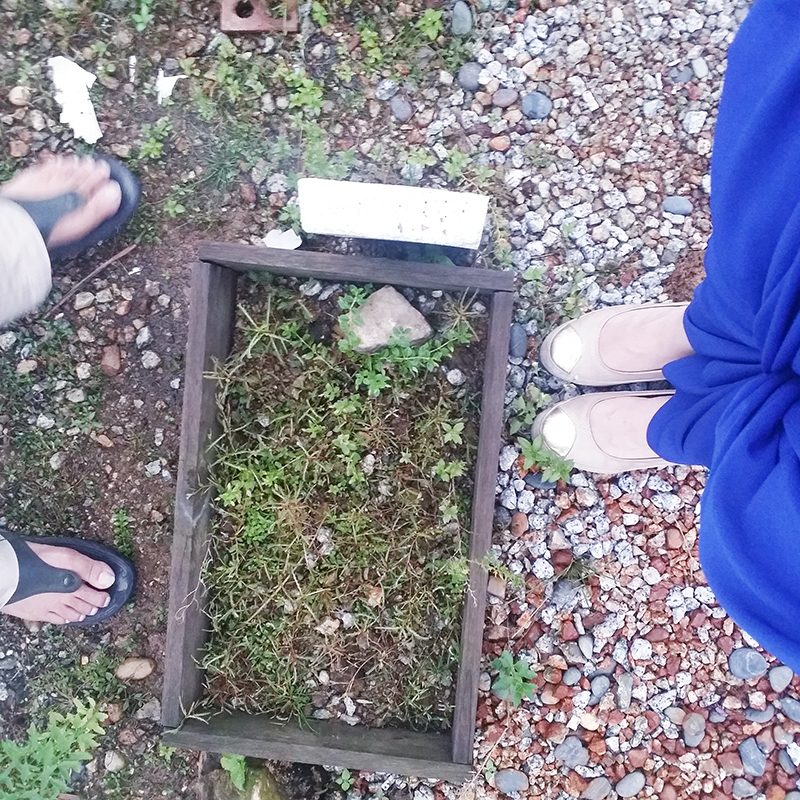 Fast forward to the next day, last Friday, Khubayb and I didn't talk about going to the grave, but in the afternoon of the first day of Raya or Syawal, we were both mentally and emotionally drained from the day before and there were just so many triggers and I was just so emotional on that day. But I tried myself not to breakdown. I didn't. 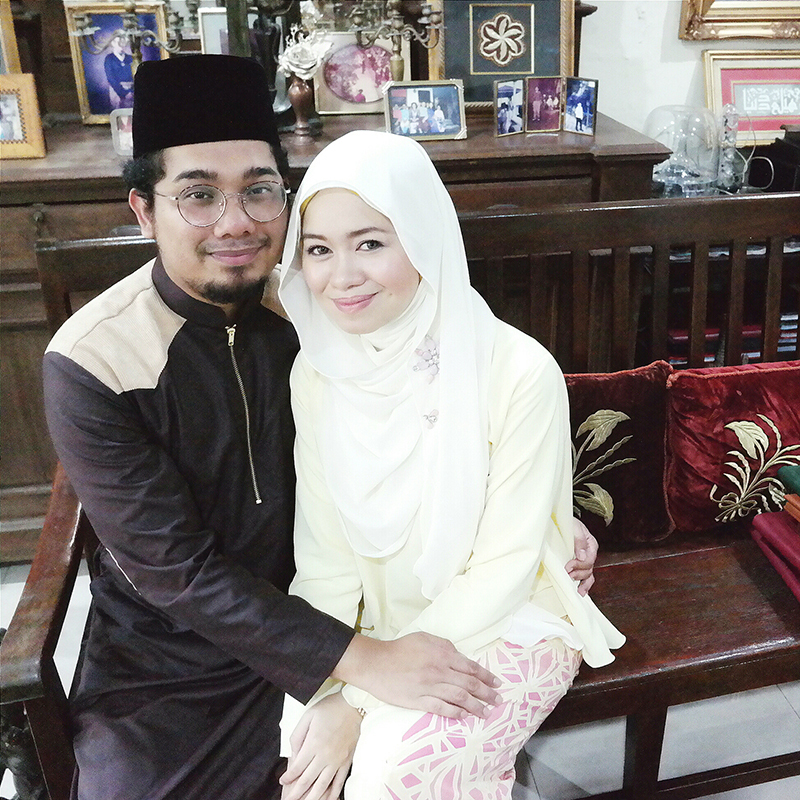 In the afternoon of the first day of Raya, I told the husband that I want to go. He thought that I wasn't ready, that's why he didn't mention it. So we went. I snapped this when we visited Jibrael's grave on 12th April 2015. I blogged about it in my post Second in Heaven : The Supposed Special Day but I couldn't share this photo when I blogged about it earlier. There's something about going though, it feels so surreal. On the way to the grave yard, I couldn't even look up. I wrote a post on Instagram. The post I shared with its caption below. The fact that I couldn't share a photo of her, or I couldn't plan for the clothes she was going to wear, or I couldn't collect duit raya for her like other mothers do is in itself heart breaking. Everytime I heard other parents planning for their children for Raya I'm happy for them but in my heart and mind I wonder what it would be like if she's here. Instead of planning where to get her clothes and other stuffs, I had to think about: "When do I go to the grave. What do I do? How do I make her grave prettier" So it's weird. It feels like the photos that I take with my husband on that day, it's incomplete. It's as if we're supposed to hold her in the middle. But Alhamdulillah, we have each other. Without the love that we have for each other we wouldn't have been able to be blessed with our child in heaven. And I know that we have to be strong because she's having the best of celebrations where she resides, the place beautiful beyond imagination, heaven. We just have to be patient till we get to meet her again, one sweet day. "Our family portrait. Another raya without you. Imagining you'll be wearing pink and yellow too today. :) But I'm pretty sure the children in heaven wears the best clothes that we on earth can't even begin to imagine ♡ You're too beautiful for earth and today Abah @kneok and Mama miss you even more than the normal days. It pains me that you're not here but I know that we both have to be patient and be strong till we meet again. You're in our hearts and mind, always. Till we reunite again one sweet day. InsyaAllah with your younger siblings too. We miss you so much Putri Jibrael Zumirrah. Al-Fatihah. #strength4jibrael #akarnsLOVE"
All praises to the Almighty for granting me the strength to start and share my feelings which I have been containing for quite some time. All praises to Him the Most Loving who has blessed me with my daughter in heaven who has taught me more about life than anyone in this world has. Alhamdulillah. I started to write this blogpost since last night but I've thought about it since the days before Raya. Wow, it's already quite a long post and I haven't even shared on my feelings when I visited her. I'll do that in my next post, God Willing.